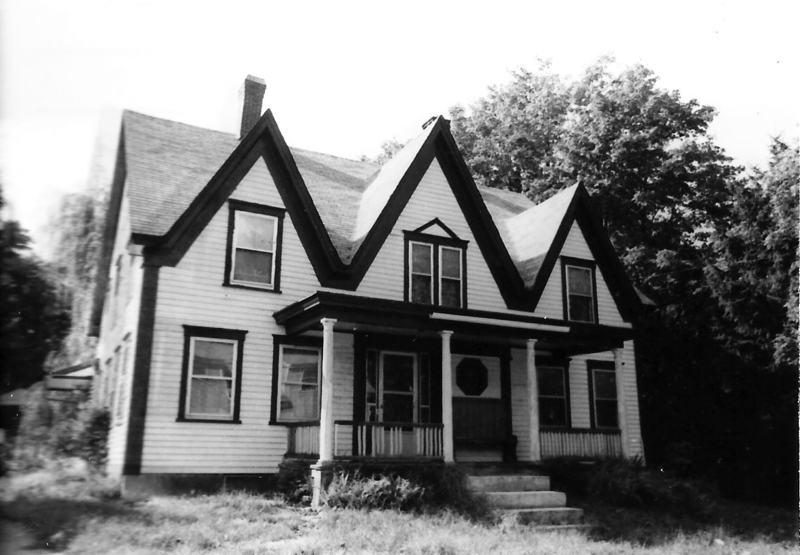 Other features: steeply cross-gabled porch is later addition. 3 gable dormers on this 1 3/4 stories home. It has 10 rooms - 1 bath, 5 bedrooms; It has 2 chimneys; enclosed back porch. This home was originally built as a two family dwelling house with a symmetrical front facade with double entrances to the north and south sides. The conversion to a single family took place in the late 1950s after Robert & Veronica Weymouth had acquired both sides of the the home. Robert, b. 1910, was a salesman and Veronica, b. 1910, a bookkeeper. 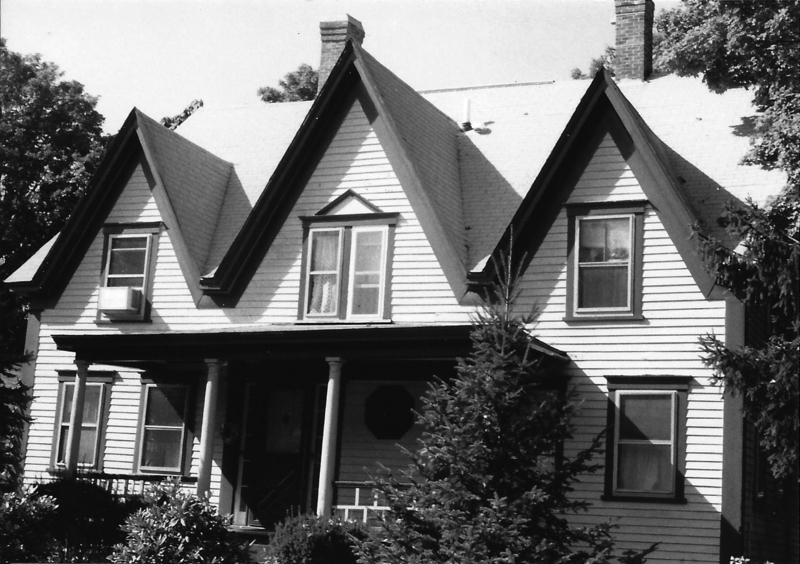 The Weymouths first purchased the the north side of the home from the Mears estate on March 4, 1949. In March 1957 they then purchased the south side of the home from the Nellie Mott estate. This home and the one next door at 53 Center St. are noted on the 1848 Darracott map of the holdings of the Ballardvale Machine Shop Co. These two homes would have been lots #3 and #5 and appear as the only houses on this section of Center St. south of Tewksbury St. It is yet unknown who built the home. Wm. Phillips Foster owned the property in the 1860s. W. Phillips Foster had considerable real estate holdings in town. In 1850 his valuations list 27 different properties in town including the Brick house & Eagle Hotel on Elm Sq. By 1860 his total real estate was valued at $27,871. W. Phillips was born January 21, 1830, the son of William Foster Jr. & Sarah W. Kimball. W. Phillips Foster died February 24, 1871 at the age of 41. His estate was settled by executors Joseph Kimball and John Abbot. This property was sold for $1250 to Lewis Clark on April 12, 1875. The deed states double dwelling house and wood shed. Clark owned the property for 42 years. Lewis Clark was born on April 14, 1830 in Tewksbury, MA, son of Peter Jr. & Mary Letitia (Baldwin) Clark. Lewis was a farmer when he married on May 5, 1859 to Elizabeth J. Barron b. Nov. 1837 in North Parish, Andover, dau. of Thomas & Sarah Barron. Lewis later became a steam fitter engineer. Lewis and Elizabeth had three children, tow daughters Sarah Jennie b. Dec. 1864 and Nellie Leticia b. Nov. 16, 1874, and in infant son Beaumont C. b. 1905 d. at two days old. Elizabeth Clark died in 1913. Lewis died in Sept. 1917. Their two daughters, Sarah Jennie Mears and Nellie L. Hinchcliffe then inherited the property. S. Jennie Clark had married Nathan E. Mears. b. Apr. 1861, a wool finisher at the Ballardvale Mills and later a conductor on the Boston & Main Railroad. They had five children, Lewis N. b. Sept. 1886, Elmer B. b. Oct. 1888, Arthur R. b. May 1892, Alice C. b. Aug. 1896 and Clyde C. b. 1907. On Feb.15, 1918 Jennie was deeded the North side of the house and her widowed sister Nellie L. was deeded the south side. Jennie died in Nov. 1948. Nellie L. Clark married on on Jan. 19, 1898 in Andover to John B. Hinchcliffe, b. Nov. 2, 1870 in Bridgeton, Maine, son of Joseph & Maria (Ainley) Hinchcliffe. John was a wool Dresser in the mill. They rented a home on Marland St. Sadly John took his life on April 23, 1912 at age 41. Nellie & John did not have children, and Nellie worked in the mill for a period of time. She later remarried in 1922 to Albert Warren Mott, a widower, with one son Leroy W. b. Sept. 15, 1895 in Boston. His former wife Ada Katherine Mears had died on July 31, 1901 in Andover. Nellie & Albert would have one son Albert W. Mott Jr. b. 1929. Husband Albert died in April 1941 age 75. Nellie died in February 1956 and was interred at Spring Grove Cemetery on Feb. 29th. in the Hinchcliffe - Clark family lot. Robert W. & Gail J. Bird on Jan. 8, 1979. Robert and Gail would own the property for 13 years selling to current owners Massih & Denise A. Massihzadegan on Dec. 31, 1992.